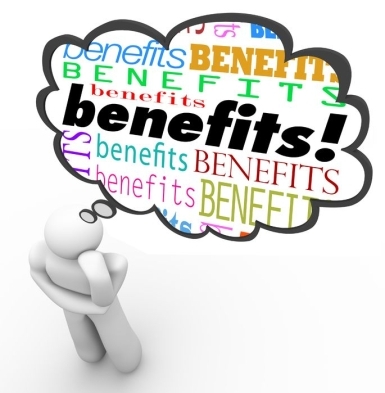 For many women employee benefits can have as much value as a salary. Nervous negotiators are so focused on the monetary offer on the table that they forget to look at the overall compensation package and other compensation possibilities. So when negotiating your salary, don't forget to thoroughly consider other employee benefits and alternative forms of financial remuneration, which can lie outside the traditional salary package. With all the recent brouhaha regarding women relying on karma for salary increases (because that works right?) I think everyone knows that you should definitely not wait for that little piece of serendipity to kick in, but that you need to take the reins yourself and assume control over your own career and compensation. Other financial benefits to look at first might include stock and share options, a perk which is particularly helpful as part of any discussions held with a start-up. Sandi paid off all her student loans including MBA and first degree fees, when she cashed in her share options. Non-financial employee benefits can prove invaluable for a professional woman. Focus on those that will strategically enhance your long-term-term career. This could cover upgraded job content and job title, access to senior meetings and network contacts within the company, that will support both your short and long term career development. Add a request for a sponsor to your list so you have a door-opener on your radar. Additional benefits can come in a more intangible form which might allow women to save on either time or net salary and therefore disposable income. It could come in the form of extra vacation as advocated by Mr. Branson. Other benefits could cover chores that women might outsource, or do, themselves. Maggie told me that having a delivery laundry service in her company saved her probably an hour or more a week, as well as the cost of outsourcing the task to a concierge service "Time is my most valuable commodity currently and this service was previously only available to executives. I made a case that having a desk pick up service would be a great perk for all employees." Some companies offer financial support 3Plus training programmes - so always ask your employer. Check out our programmes here! If you are talking about internal promotions and possibilities, subsidized childcare or on site crèches can make life easier for a professional parent. A subsidized in-house crèche saves Tania €500 per month and having the possibility to drop her two-year old in the building next to her office is an added bonus. That saves her and her partner as much as one hour a day, which would otherwise be spent in traffic. If involved in new job offer negotiations, consider not just the financial compensation but other equally valuable possibilities. A subsidized academic programme with study leave, an executive coach or other professional training can all enhance career prospects long-term. But don't forget that these types of benefits do not contribute to pensionable earnings. Not willing to subscribe to the 24/7 ethos of male dominated corporate culture, many women seek what is becoming known as "life-style" careers. In this way they believe they can combine professional activity with family and domestic responsibilities, by down shifting to working part-time. But is this a good move? Victoria Pynchon, 3Plus Coach and negotiation skills specialist advises women against a request to reduce to part-time hours, indicating that this can be a disadvantageous path to go down. At a 3Plus Mini-Coaching session earlier this year she told the group "We all know that women who work half-time end up working 80% time. It's only the salary that is cut in half. Instead of negotiating reduced hours, switch your focus to negotiating flexi-time or remote working. Make a case for the value you can add to your business, by working smarter and differently, whether on a flexible basis or via tele-commuting. You don't see men asking for part-time hours"
Recent research in many economies suggests that women in later life will be seriously disadvantaged by mid-career breaks or reduced hours to take care of their families. This impacts their life long earning potential. A disturbing number of women over 65 face increased poverty when they reach pensionable age. Career gaps, accepting consistently lower levels of salary over the course of a careers, divorce and widowhood all contribute to this exposure to financial vulnerability, as total life time earnings are reduced. If you have important negotiations coming up, check out our whole series. Negotiate benefits and salaries the right way!